Beneath the Rowan Tree: Tickety Bu :: Woohoo! Do it Yourself Fabric? Paint Your Own Prints! 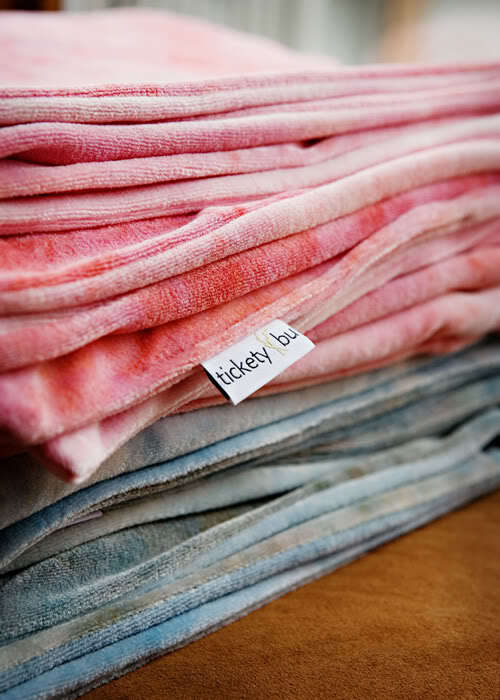 Kristi is the Mistress of Bamboo ~ she makes the most luxurious and beautiful blankets with hand dyed bamboo velour through her shop : Tickety Bu. Her line of products include her staple Cuddle Blanket for babies and young children plus the gigantic Cuddle Throw (we have one here that is everyone's favourite blanket to snuggle under all year round) and the Bitty Bu (baby lovey size), Bitey Bu (a Bitty with a Bitey wooden teether), the medium sized Mezzo Bu and bamboo terry hooded bath towels (super absorbant and super pretty, a bath time staple in our home). Prefold diapers, wipes and wash cloths, too (and more I am forgetting I am sure!). 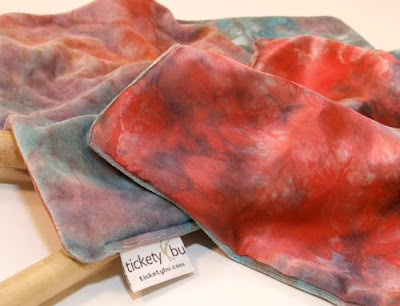 You *need* to try bamboo velour washcloths. You'll never look back! Next week, Kristi is introducing two new products to her shop. I want to tell you about one of them... the Silky Bu! Yep, BTRT silk (silk satin, 12 momme, SO smooth and silky!) hand dyed and paired with matching Tickety Bu bamboo velour colorways to make a 14" square lovey for the wee ones~ plush, soft bamboo velour on one side and smooth, cool silk on the other, a tactile delight! 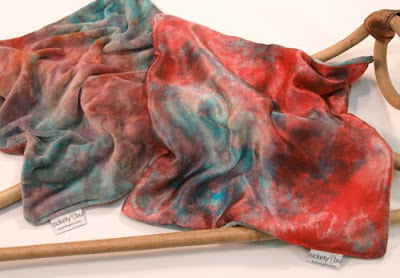 All dyed in professional dyes for long life (and safe chewing!). Be sure to take a peek, and don't miss the stocking on April 1st at 9 pm.